A new lecture focusing in the formation and role of solids in diverse astrophysical environments will be available in the fall of 2016. The wide spectrum of topics that will be covered, lectures will be given by specialists in different fields: Julia Walter-Roszjár, Thomas Posch, Josef Hron, Walter Nowotny, Stefan Wallner and myself. 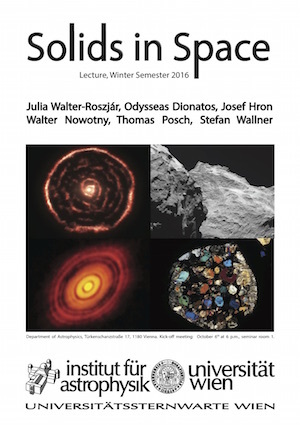 The series of lectures will also include hands on sessions on sections of meteorites as well as a visit to the very rich collection of meteorites in the Natural History Museum of Vienna.